A rythym puzzle game, where you create your own music and solve puzzles. 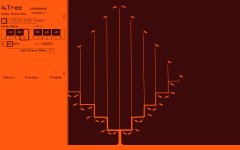 Using a synthesizer (modified MÖAN by vrld) and the LÖVE engine by creating epic trees where every leaf is a note! Challenge mode, where you piece songs and tunes back together by ear. Sandbox, let your creativity run wild with the entire synthesizer at your fingertips and the ability to export your creations as levels to send to your friends. June,9th,2012: An article some news and a bunch of virtual deer. Apr,25th,2012: Developing value and reducing tedium. Apr,17th,2012: Hello and thankyou for noticing my game. This is the last development version before I abandoned the project, it's bundled together with a few other finished and prototype projects in my OW_HUB launcher. Contains a bunch of features that were never explained by tooltips like middlemouse to change tool and pitch and volume adjusting with both mousewheel and left and right mouse, any pitch below 0 is invalid and will be nullified. Last edited by StoneCrow on Thu Apr 04, 2013 10:40 pm, edited 10 times in total. Roland_Yonaba wrote: Seriously, that looks awful. I second that (Well, not the "awful" part!) But when I saw this long ago (in "what's you working") I got a bit interested in see this come out. So StoneCrow stop be "junked" somewhere and start release your nice projects that you keep posting in forum! Last edited by coffee on Fri May 11, 2012 11:13 am, edited 1 time in total. There is a pretty mode that I'm working on, but cause of everything thats going on at once I don't want to work on it until I've got the basic game down (also im working on a setting that doesn't use canvases atm). No releases yet, sorry mate. Gonna get a demo out as soon as i have the sandbox area fully featured. Last edited by StoneCrow on Fri May 11, 2012 11:48 am, edited 1 time in total. StoneCrow wrote: Really it looks awful? StoneCrow wrote: No releases yet, sorry mate. Gonna get a demo out as soon as i have the sandbox area fully featured. Fine. I'll be following this, then. Lost in translation has reached a new level. Translating the italian for "Berlusconi didn't win the elections" into any other languages results in "Berlusconi won the elections"
Nixola if your computer doesn't run canvases is it really slow? Asking with regards to bothering to put non-canvas support into some of the better graphical options.